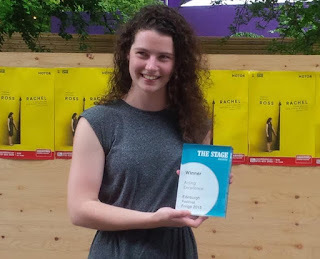 Molly Vevers has been awarded The Stage Award for Acting Excellence (solo performance) for James Fritz’s Ross & Rachel. A dark and uncompromising new play about romance, expectation and mortality,Ross & Rachel tells the mind-bending, heart-breaking story of what happens when a couple that was always meant to be together, gets together. And stays together. In this disquieting duologue for one performer, Olivier-nominated playwright James Fritz (FOUR MINUTES TWELVE SECONDS, Hampstead) takes an unflinching look at the myths of modern love. Ross & Rachel is at Assembly every day (except 17th August) at 12.30pm.